Chongjin is the DPRK’s 3rd largest city and largest city in North Hamgyong Province in the northeast corner of the Korean peninsula. Today DPRK’s ‘city of steel’, home to the enormous Kim Chaek Iron and Steel Complex, at the turn of the 20th century it was little more than ‘…a small fishing village with about 100 inhabitants’. For much of recent history, Chongjin’s southern neighbor of Kyongsong was the major administrative and economic centre of the province. The Japanese victory in the Russo-Japanese War and establishment of a protectorate over Korea in 1905 changed that. Chongjin became the site of a modern seaport, a stop on a major rail line running up the East Coast of Korea into Manchuria. By 1908 the population was 8,000, growing to 23,407 in 1928, and 72,353 by 1938 (Lautensach, 1945: 207-208). The harbour itself became a major centre for maritime trade and fishing fleets. Chongjin literally means ‘blue harbour’. Here a postcard of the port during the colonial era posted by Book Hunter, a South Korean blogger. 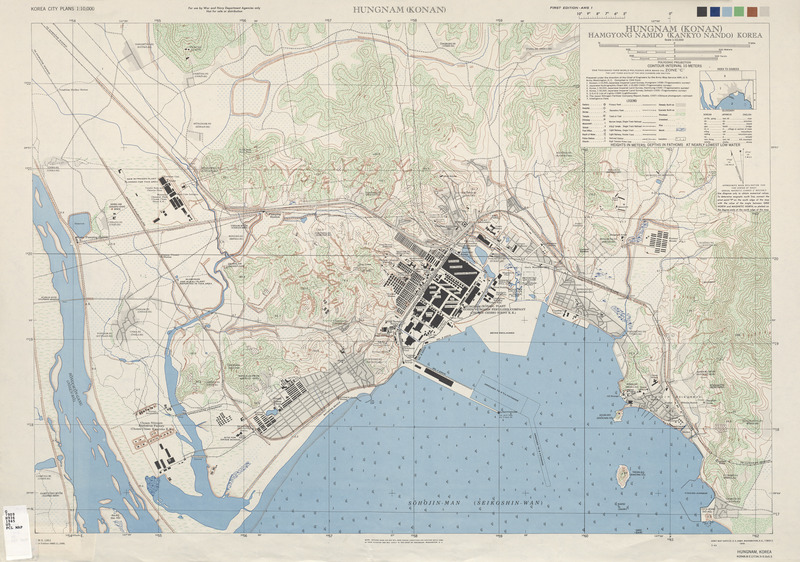 And a detailed map of Chongjin Harbour in 1946, a year after the end of the colonial era. And a photos of the harbour today from the heights of Komalsan taken by Koryo Tours' tour leader Jessica (Instagram: jeskimojay). The Kinolibrary, an independent agency for archival footage, has placed two videos of Chongjin between the 1950's-1960's on YouTube. The first clip depicts a pleasure cruise starting in Chongjin Harbour. The second clip shows a fishing boat out of the same harbour. And some footage of the port in 2016 from Korean news.